A coup attempt has been launched in Burundi to try to overthrow President Pierre Nkurunziza, amid unrest over his bid to be re-elected to a third term. 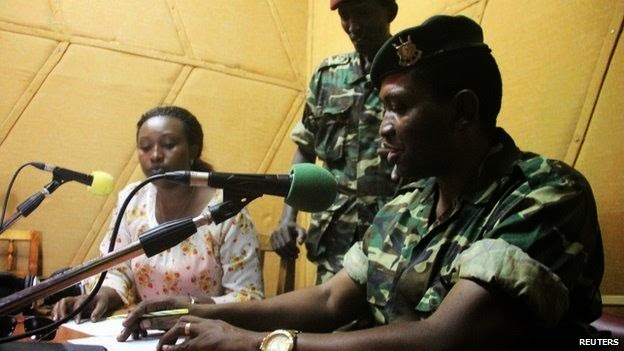 Thousands of people in the capital, Bujumbura, celebrated the announcement by Major General Godefroid Niyombare. But the coup outcome is far from clear. The presidency said it had been foiled. 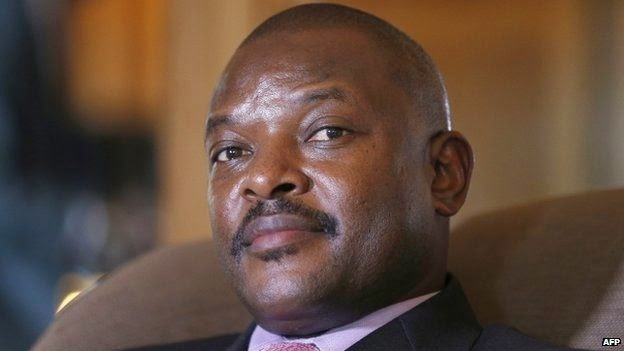 Mr Nkurunziza left a summit he was attending in Tanzania to try to return home but some unconfirmed reports say his plane has now returned to Tanzania. Gen Niyombare said in a radio address he had ordered "the closure of the airport and border, and I ask every citizen and law enforcement down to the airport to protect it". Mr Nkurunziza had been in Dar es Salaam to discuss the crisis with regional leaders. Tanzanian President Jakaya Kikwete said the summit condemned the coup. A statement from the Burundi presidency said: "It is with regret that we have learned that a group from the armed forces mutinied this morning and declared an imaginary coup. "This coup attempt has been foiled and that these people, who read the coup announcement on the radio, are being hunted by defence and security forces so that they can be brought to justice." A presidential spokesman said Mr Nkurunziza would address the nation on his return and was not afraid. UN Secretary-General Ban Ki-moon urged all parties to exercise restraint. The BBC's Maud Jullien in Bujumbura says thousands of protesters marched to the city centre alongside soldiers and two tanks after the coup was announced. Police shot at the soldiers and the crowd. At least two protesters were killed. What I can see right now is a lot of police checks on the road. They are stopping every vehicle, ensuring that those traveling are not carrying any weapons. We can see truckloads of army personnel driving past where I am standing, perhaps trying to get them to military bases. When the general made the announcement there was a mixed reaction and some gunfire around the capital. In some parts there was panic and fear; people were running to safety, locking themselves into any building they could find. But there were also those who were celebrating, saying that this is what they wanted. The protesters continued to march, one telling the BBC this was a victory after weeks of protests.